Sheds have come a long way since the man-cave cliché. These days, a shed is a far more democratic place – somewhere that symbolises the privacy and space that we all need. 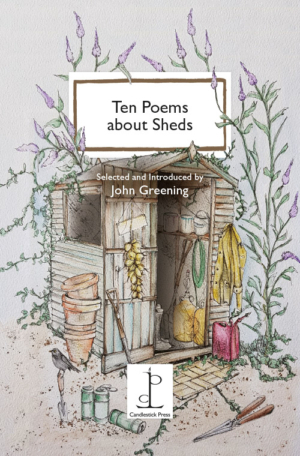 John Greening’s wonderfully varied selection of poems explores sheds from every imaginable angle. The poems take us to a child’s hiding place, a treasury of exotic implements and rich aromas and a retreat in which to remember the past. Derek Mahon’s fêted poem ‘A Disused Shed in Co. Wexford’ creates a mysterious inner world which seems to exist outside time. Poems by Fleur Adcock, Alison Brackenbury, John Greening, Stuart Henson, Kathleen Jamie, Derek Mahon, John McAuliffe, MR Peacocke, Carol Rumens, Vernon Scannell.